Heartbleed Bug Vulnerability Affecting Internet Community. Fortunately, our servers were not affected by the Heartbleed bug when it was publicly disclosed. We have updated the necessary files as a pre-caution. How has Bethel servers and my account been affected by Heartbleed? 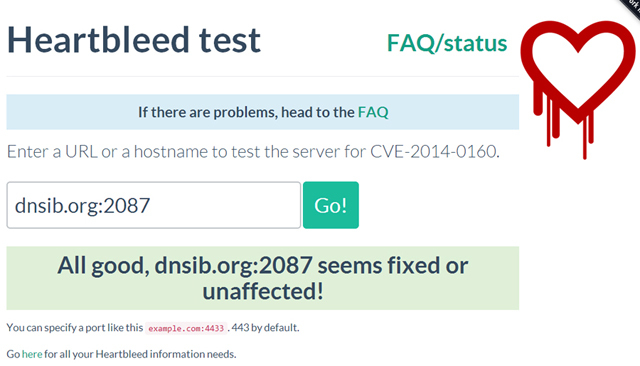 The Bethelwebhost.com website, our servers, and the clients.bethelwebhost.com, bethel.dnsib.org SSL certificate end point were not vulnerable to the Heartbleed bug when it was publicly disclosed on April 7th 2014. Any secure communication with our servers, such as logging into the members area, cPanel, WHM and webmail would not be affected by any attacks following the public disclosure of the Heartbleed bug. The Heartbleed bug has had a profound impact on the transmission of secure data throughout the Internet. It is for that reason that we are encouraging our customers to reset their member area, cPanel, WHM and webmail passwords at their earliest convenience as a matter of common password maintenance. Please remember to always make your passwords unique, random, and periodically rotate them. We recommend that you take precautionary action, better safe than sorry.